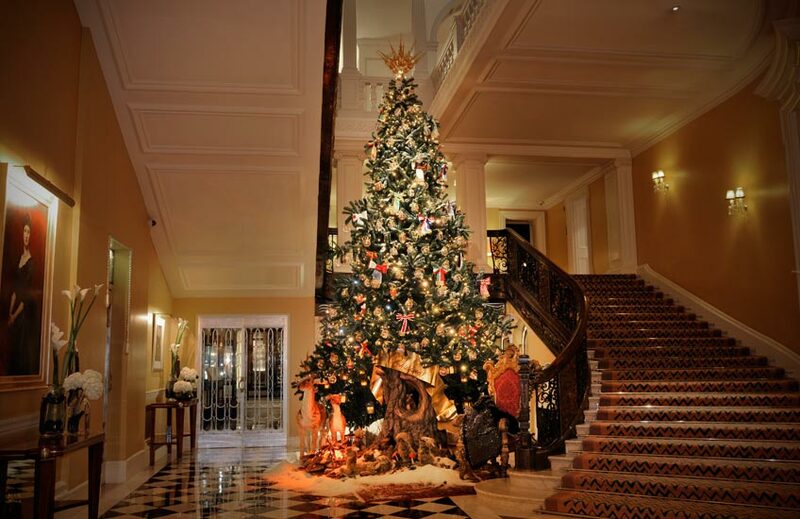 Each year, the task of designing Claridge’s christmas tree – the one that takes pride of place in the hotel’s famous lobby – is bestowed to a renowned designer. The display of the premier 5-star hotel has become a destination in and of itself, with names such as John Galliano and Dolce & Gabbana making up impressive roster. 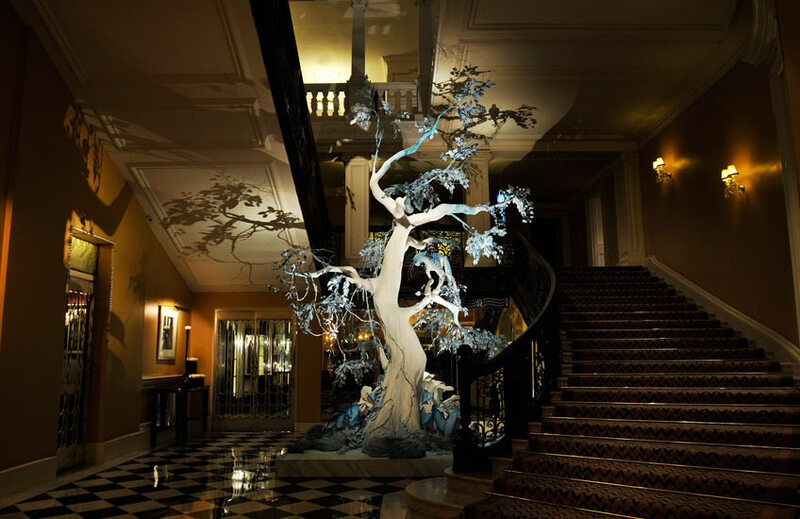 This year, the prestigious Mayfair spot is home to a tree designed by Apple Chief Design Officer Jony Ive and fellow Apple creative Marc Newson. Described as “an immersive experience that plays with the relationship between nature and technology, tradition and the future and between three dimensions and two”, this year’s installation is not so much a singular tree than it is a veritable forest. And a magical one at that. Light boxes bring to life photographic woodland scenes of frosted silver birches, whilst cast Scots pine models mark the display’s four corners. Underfoot, a carpet of pure white floors the space and overhead hangs a lush canopy of green pine. The most captivating element of all, however, is a young, three-foot-tall sapling – “a [symbol] of the future”. 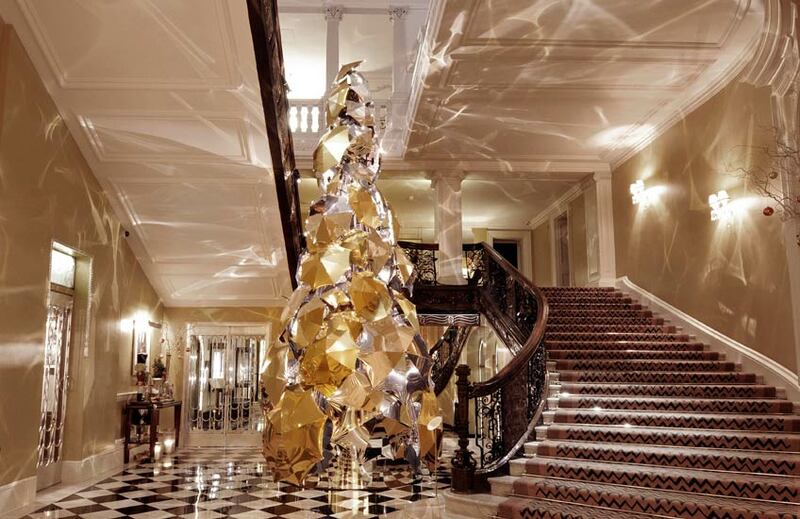 Last Christmas, Claridge’s lobby was adorned with an innovative and modern masterpiece, designed by Burberry Chief Creative and Chief Executive Officer, Christopher Bailey. Marking the first year a Brit had designed a tree for the famous lobby, it was an outstanding nod to London and the key part both Burberry and Claridges play in the heritage of the city. Made up of almost 100 umbrellas, each finished in bespoke gold and silver metallic fabric, the tree paid homage to Burberry and it’s reputation as the luxury brand to go to for chic protection against the elements. An impressive 77,000 individual lights provided a twinkling display whenever someone interacted with the tree, creating a stunning exploration of light and a remarkable festive display. Contrasting the hotel’s Art Deco lobby, Domenico Dolce and Stefano Gabbana brought a beautiful woodland display to life in the heart of the world capital. The legendary Italian designers took inspiration from their childhood memories to design their second magical Christmas tree for the famous hotel. Presenting a whimsical fantasy-inspired scene with animated animals gathered by the warmth of the fire, the tree was reminiscent of a page from a children’s story book. Adorned with over 300 glass baubles, expertly blown by master artisans and hand-painted with international flags, the tree recognised the many festive traditions held all across the world. Oversized ribbons also represented many different countries, handmade by Dolce & Gabbana’s incredibly talented tailors. For their first offering to the hotel’s famous lobby, Domenico Dolce and Stefano Gabbana chose to pay tribute to their Italian heritage. The tree was adorned with more than 450 festive glass baubles, blown by master artisans and hand-painted with images to recreate a Sicilian garden. 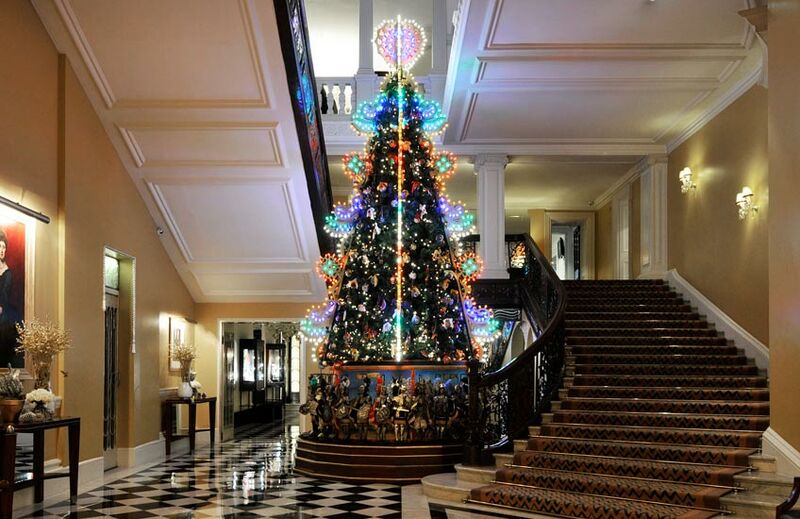 The 7 metre-high tree was framed with multi-coloured ‘luminarie’ lighting, casting a green, red, yellow and blue festive glow that warmed the hotel interior. The striking display recalls the traditional illuminations seen in Italian streets around Christmastime. Thirty handcrafted wooden Sicilian marionettes stood guard around the base of the tree, crafted in the likeness of Charlemagne and other medieval knights. Taking a natural approach, the founder of luxury florist McQueens, Kally Ellis, evoked a sense of the great outdoors with her impressive Christmas tree display. Designed to take the image of a real life magnolia tree covered with lichen moss, it wouldn’t have looked out of place in a forest. Only the applied adornments set it apart as a festive display, with studded crystals and metallic jewel eggs creating a canopy of colour and glamour. 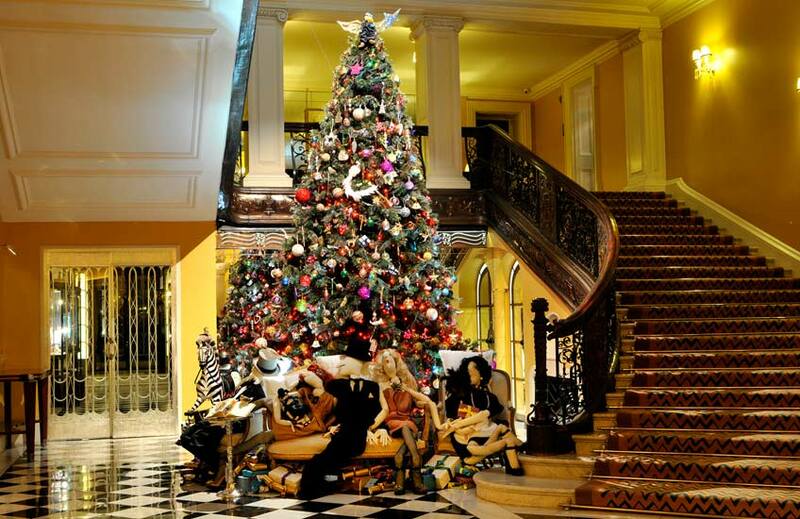 In 2011, the Claridge’s foyer was graced with a Christmas display designed by Alber Elbaz for Lanvin. In his display, Elbaz brought to life a fantastical Christmas dream in the form of a dazzling multicoloured design. Adorned in a striking array of baubles, ornaments and lights, the tree was topped with a silk figurine of the designer himself, complete with festive fairy wings and a wand. A charming tableau of caricatures sat around the base of the tree, portraying the Lanvin family as well as the hotel’s doorman and maid. A large zebra, a glamorous seating arrangement and a vibrant display of gifts completed the whimsical design, bringing a sense of quirky style to the famous London hotel. 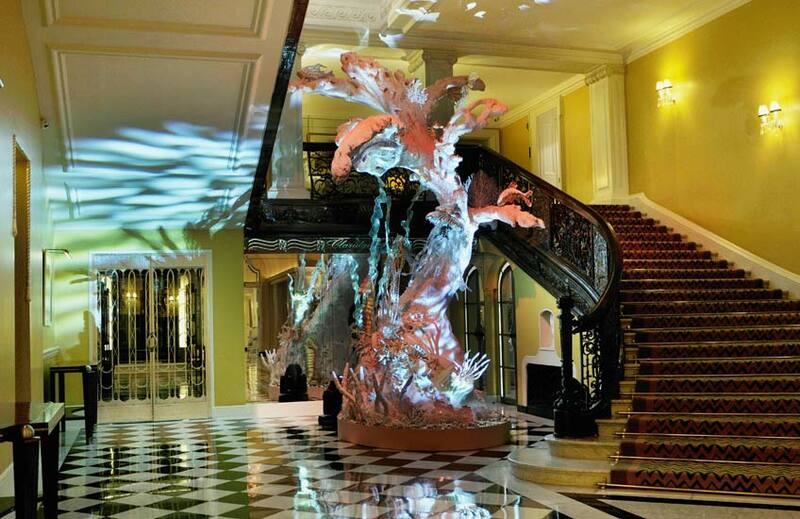 In his second year of creating a magnificent festive display for Claridge’s, John Galliano turned the famous lobby into an under-the-sea paradise. Drawing upon the beauty of the ocean as his source for inspiration, Galliano filled the space with dazzling aquatic designs. The truly remarkable display showcased sparkling silver leaves and stunning pink corals, with colourful jellyfish and seahorses adding a fanciful touch. 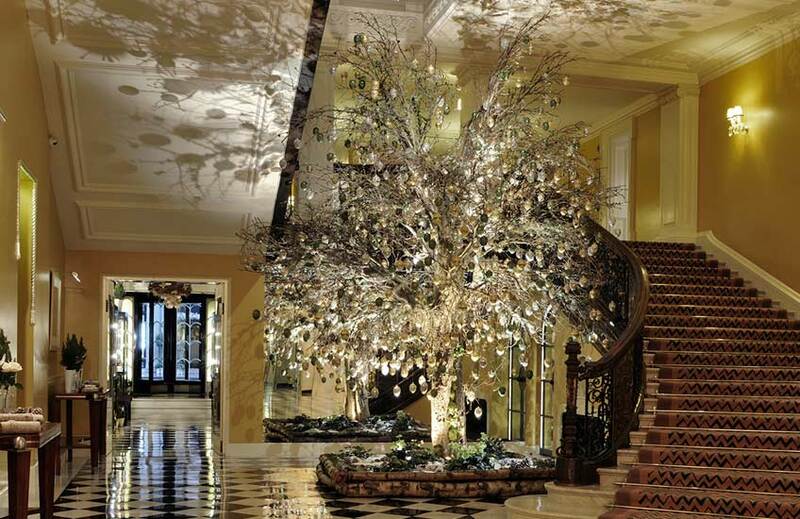 The very first festive collaboration between Claridge’s and a famous designer happened in 2009, when the Mayfair hotel teamed up with iconic fashion designer John Galliano. The design took a dramatic twist on tradition and created a very unique Christmas display by forgoing a traditional fir tree and opting instead for a dramatic, knarled tree. The display made for a perfect winter wonderland addition thanks to its use of a cooling blue and white palette, as well as sparkling leaves and orchids. Creating an interesting fusion of hot and cold climates, the tropical-style tree was home to both handmade snow leopards and parrots, offering a striking and visually intriguing design. Dominating the hotel’s lobby in a way that only his signature theatrical and outlandish style could, Galliano’s design inspired an annual revival of the display.